How To Make Kiddie Microloans With Automatic Parent Payback - Plus Interest! So your kid wants to buy something special in a moderate price range, but doesn’t have the funds to cover it yet. The preferred parental response? Wait until you’ve saved enough! You know, delayed gratification and all that. But occasionally, you’re OK with floating a small short term loan. That is, as long as it’s formally tracked and repaid. In fact, you’ll even charge a little “Bank of Mom/Dad” loan interest on top. That drives the point home that borrowing money isn’t free. It also discourages a cavalier attitude toward loans in the future. Good learning opportunity. Good plan. The catch? It’s a lot of work for a busy parent to track kiddie microloans manually. And failing to follow through on collecting would send a disastrous financial message to the kids. Kids who get off scot-free on parental advances will have a rude awakening with that first credit card as young adults. No worries! There’s a super simple, fully automated way for even the most distracted parents to make short term loans to their kids. 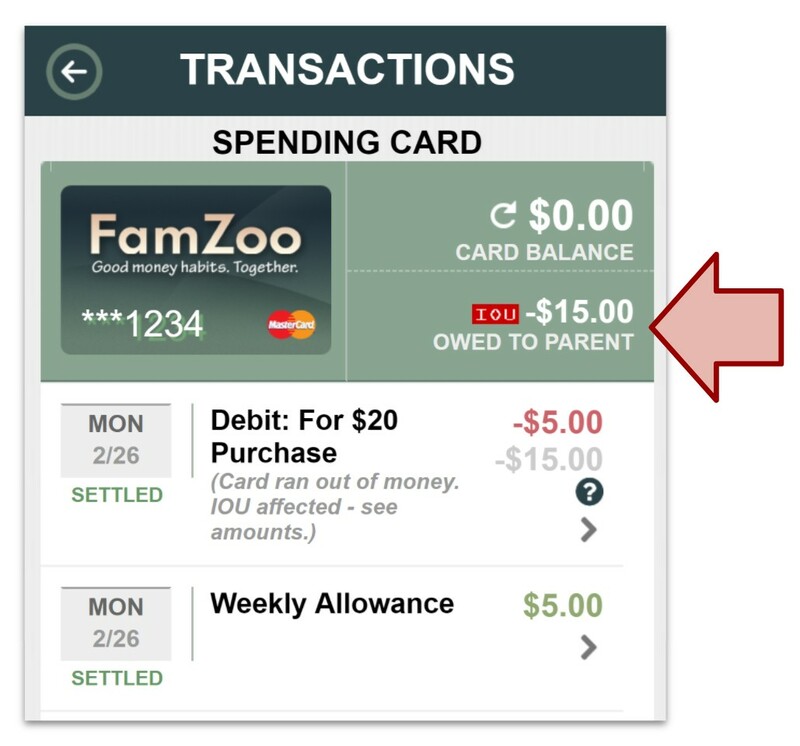 It takes advantage of FamZoo’s unique built-in IOU accounting between the primary funding card and the other cards in the family. 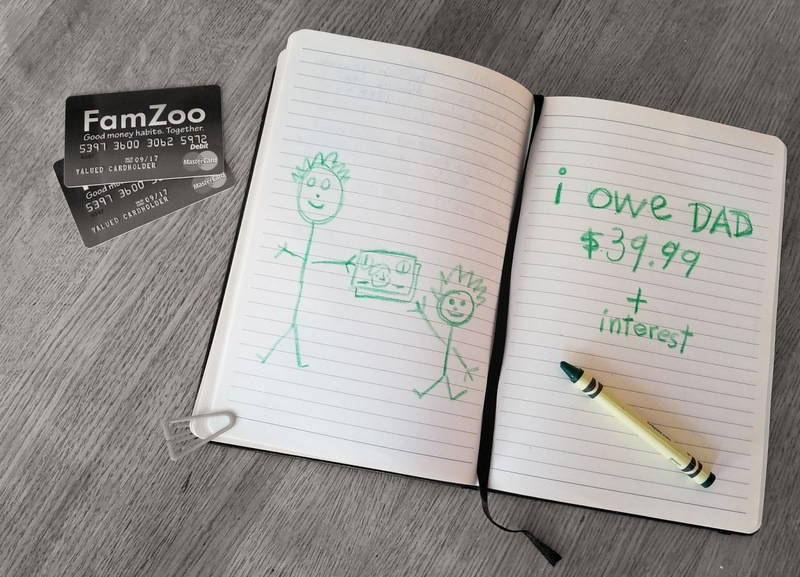 Add a loan interest rate to your child’s card. Visit the card’s account settings form and fill in the loan interest rate, frequency of assessment, and an optional maximum penalty amount. Purchase the item for your child. Since your child doesn’t have the money, you’ll need to make the purchase. Just be darn sure to complete the next step to enforce accountability on the loan! Debit your kid’s card. Deduct the full purchase price from your child’s card using the minus icon next to the account. That will transfer any remaining money on the child card to your primary funding card and record the shortfall amount as an IOU. For example, suppose the purchase price is $20, and your child has $5 on the card. Debit the card $20. $5 will immediately flow to your primary funding card taking the child card’s cash balance to zero. The remaining $15 will be recorded as an IOU to be repaid later. 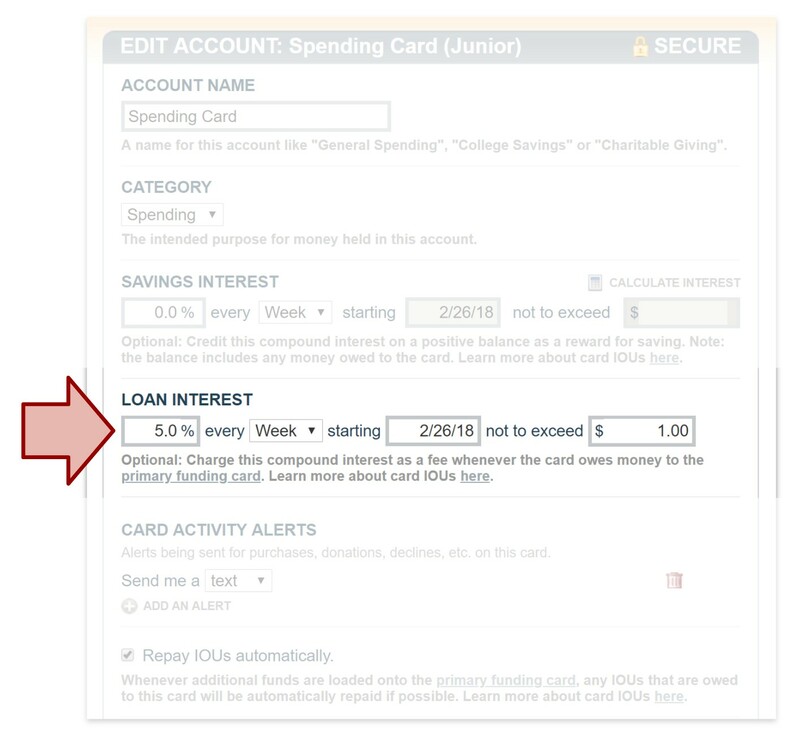 Turn on card activity alerts to announce any interest penalties as they are assessed. That will motivate your child to pay back the debt promptly, as will the inability to buy anything with the card until its balance is back above water. Note: If your child needs money on the card for everyday expenses, you can use a slightly more elaborate loan payback system using a separate IOU account. So how does your child pay you back? By having their wages “garnished”. Until the debt is repaid, all incoming allowance and chore payments or ad hoc credits will simply reduce the IOU amount without moving any actual dollars from your “Bank of Mom/Dad” card. For example, if Junior owes you $20 and a scheduled $5 weekly allowance payment hits, no money will actually move from your card to Junior’s. Instead, the IOU amount on Junior’s card will just be reduced from $20 to $15. Junior just paid back $5 on your loan. $15 more to go! Once the IOU is fully paid off, allowance or chore payments and ad hoc credits will resume transferring actual money again. Easy peasy! It’s the ultimate automated kiddie micro-loan with guaranteed accountability. Nice functionality! I'll have to play around with this sometime. I recently used the method of creating a separate IOU account for my daughter to borrow money for concert tickets. Because I wanted her to learn the responsibility of "paying the bills", I did not use automatic funding to repay the IOU, but created a series of checklist items to enable her to pay back the loan (I created daily checklist items for $5, $10, $20, so that she could pay back on her own). It worked, but I have to say, I would really be soooo much easier if kids were had the ability to move money between their own accounts, and make payments to each other (and me) on their own. Gradually more and more lenders and creditors are offering mortgages along with bad credit. But with short term loans direct lenders it is really easy to get loans. Just let them help you to find a lender. The lenders will give you a loan.